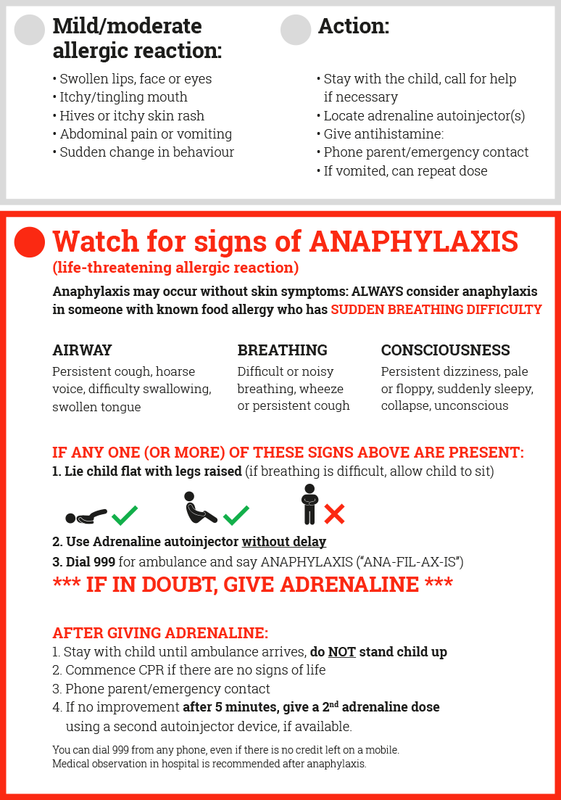 Although most mild reactions resolve, occasionally they can worsen and develop into anaphylaxis: anyone having a mild-moderate (non-anaphylaxis) reaction should be monitored (e.g. in the first aid area) for any progression in symptoms. You should administer the pupil’s own AAI if available, if not use the “spare” AAI, so long as the necessary consents are in place. AAIs can be administered through clothes and should be injected into the outer mid-thigh, in line with the manufacturer’s instructions. If the child has their own AAI prescribed, give the AAI and then dial 999. Always call for an ambulance, even if the person has already self-administered their own AAI and is feeling better. A person receiving an adrenaline injection should always be taken to hospital for monitoring afterwards. If the pupil is transferred to hospital, the hospital will inform the GP about the reaction.